Earn up to 2,168 reward points. Delivers vintage delay plus authentic slapback. 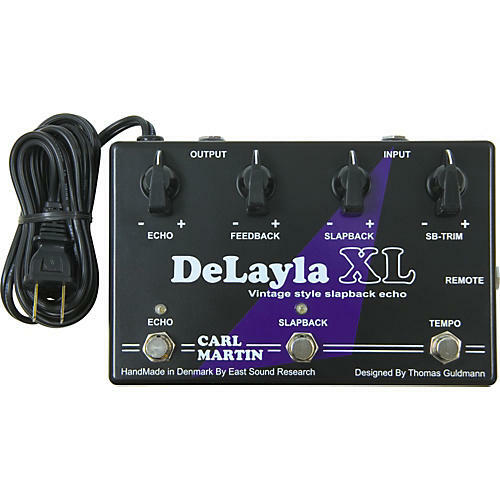 The Carl Martin DeLayla XL Delay Pedal was designed and developed to have the same sonic quality as the original DeLayla and adds a second delay head for the ultimate in vintage slapback echo. The response of the second head can be fine-tuned, is controllable by footswitch, and can be blended with the first head. The Carl Martin DeLayla delivers warm, smooth delay and echo reminiscent of vintage tape units, but with modern features. The Delayla XL has a tap tempo and a built-in power supply.